The Wolf River Greenway is a corridor of protected green space along the Wolf River that includes a paved pathway for non-motorized transportation. Built in phases, this 10-foot and 12-foot wide pathway will eventually extend a total of 36 miles to connect neighborhoods all the way from the north end of Mud Island, in downtown Memphis, through the neighborhoods of north central Memphis, connecting to Shelby Farms and then to the cities of Germantown and Collierville, Tennessee. In accordance with other established greenways across the country, the Wolf River Greenway will help to connect people and communities, raise property values, reduce crime, encourage healthy lifestyles, and improve the general quality of life in adjacent neighborhoods. Meandering along the banks of the Wolf River, this scenic greenway will be a centerpiece for the transformation of the Mid-South into a 21st century community, allowing users to experience the natural beauty of bottomland hardwood forests and wetlands, and to visit local shops and cafes along the way via multiple access points. The Wolf River Greenway will also intersect with other area trail systems including the Shelby Farms Greenline, providing visitors with a link to the largest urban park, Shelby Farms Park, in the United States. The initial phase of the project, completed in 2010, extends from Walnut Grove Road to Shady Grove Road along the southern bank of the Wolf River to Germantown City Greenway system, a total of 2.6 miles. Currently, the Wolf River Conservancy is partnering with the City of Memphis to construct an additional 23 miles of the Greenway from the north end of Mud Island, in downtown Memphis, to the completed sections of the Greenway at Walnut Grove Road. The open sections of the Wolf River Greenway are managed by the City of Memphis and City of Germantown, respectively. The 23-mile portion of the Greenway within the City of Memphis will be managed by the City of Memphis. WRC is currently working with the City to prepare a Governance, Operations and Management Plan for Memphis portion of the Greenway. 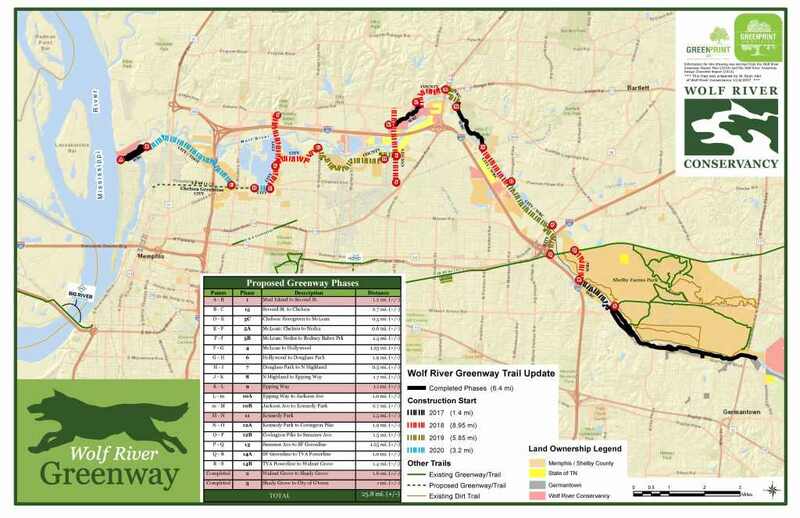 To learn more, visit the links listed along the right hand side of this page, including our FAQ page which provides detailed information about the Wolf River Greenway.